Protracted until the morning of the party, on duty in the night shift, insomnia and as a result – dull, pale, edematous skin. How to rectify the situation, in a short time to return to face a glow and healthy radiance? Healthier skin will help contrast the washing and wiping ice. It must be taken care of ahead of time: evening freeze mineral water, which is good to add herbs (chamomile, sage, nettle, St. John's wort, calendula). Spend an ice cube massaging gently for one to two minutes. The face is not wipe, let moisture nourish skin enough. Try and Express such a method. Two towels should be moistened in hot water and put on the face so to cover the eyes, forehead, cheeks, chin. Wait 2 minutes and then dip the towel in cold water and again cover the face. After two minutes, remove and enjoy younger-looking skin. If you have finished lifting means, use them for restorative procedures. And you can prepare an effective mask. So, for dry skin curd, it will refresh the face, giving him back the blush. One tablespoon of curd mash with 2 tablespoons of sour cream and add to the mixture a teaspoon of salt. The mask is applied for half an hour and then washed off with warm water. Oily skin will be healthier, will make a nice matte following mask. Take a teaspoon of honey and vegetable oil, mix with chicken egg yolk, a tablespoon of milk and few drops of lemon juice. Apply to face, wait 20 minutes, rinse thoroughly. 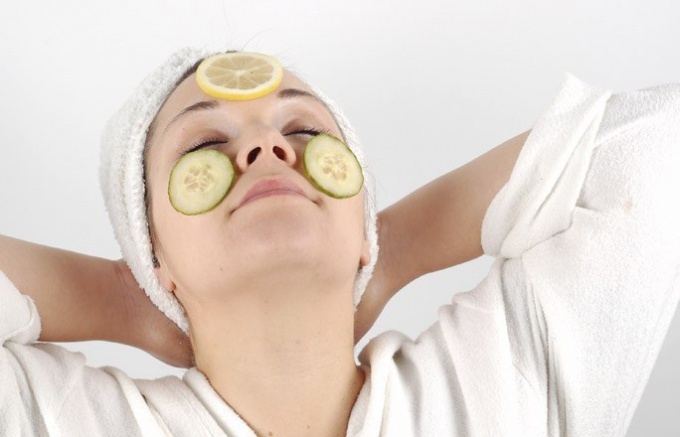 Ever lose unpleasant swelling and puffiness if make them a cucumber compress. For this small cucumber should be rubbed on a medium grater, wrap mush in 2 paper towels and put on your eyes. Wash off after ten minutes. The result will please you. After the refreshing procedure is carried out, comes the turn of a day cream. Causing his, stroking the skin, gently massage her. And then adjust the complexion with light make-up: Foundation powder and blush.